The internet is teeming with hacks and tricks, and as we all know, a lot of them just aren't true. It's the nature of the beast. 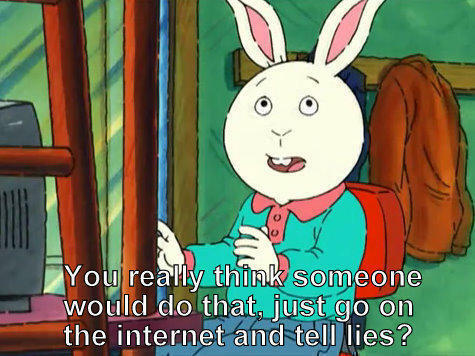 The same freedom that allows anyone to have a voice on the web also means people just get on the internet and tell lies (it's true, Buster)! I saw this trick a while back for how to pre-scramble eggs before you cook them and I was mildly skeptical. It really felt like another internet lie. Since we're looking forward to the Easter season and eggs have been on my brain, this trick came to mind and I decided to be the guinea pig and try my hand at some golden eggs. I'm here to tell you: it's no lie! Eggs are inherently feminine, right? They are a direct manifestation of a female creature walking around, just doing her female thing. Easter, back in its day, was pretty feminine too. Originally a celebration of the spring equinox, it's a day that used to be set aside in reverence of the Sumerian goddess of love and fertility, Ishtar. You know what else is pretty womanly? Me! The author of this post! With all of these elements combined (plus a dash of energy from the influx of female empowerment that I'm feeling everywhere around me), I decided to decorate my Easter eggs in pink and symbols of power. Girl power. Spring has sprung and Easter egg season is here! Gone are the days of simply dropping tablets into water and vinegar and plastic-wrapping your eggs. Though there's nothing wrong with the classic method, the sky is really the limit when it comes to egg decorating, and DIYing a dozen has never been easier or more beautiful. We've rounded up fifty of the best DIY egg-dyeing and decorating projects to inspire you! Last night I concocted this dish, well I thought I did, till a fellow instagrammer pointed out that in the North Africa it's affectionately known as Shakshuka and is an Israeli staple... go figure! These sweet little egg candles are a snap to make. Heidi says 1/3 pounds of beeswax filled six hollowed out eggshells to complete her project. The candlelight through the shells is particularly lovely, no? For the entire how-to, visit Mom's Crafty Space. After all the eggs have been found on Easter, they're often forgotten. Soon thereafter, however, you realize you should probably DO something with them. You know...eat them. Deviled eggs are our first go-to recipe, but here's a slew of wonderful and weird recipes that will make those leftover Easter eggs disappear in no time. 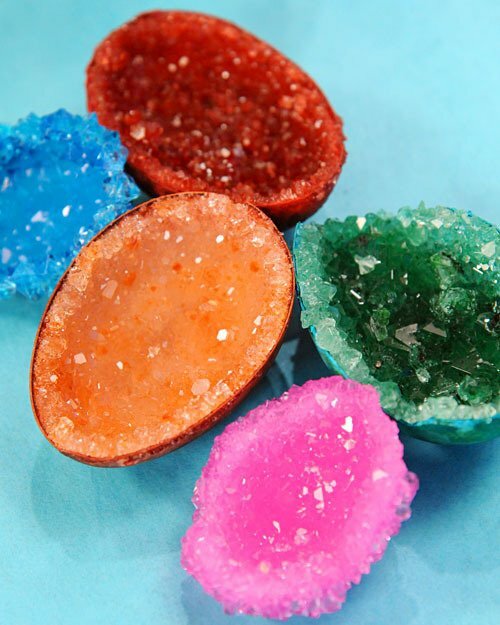 Skip the traditional Easter eggs this year and make crystal egg geodes. (Yeah, baby.) Equal parts craft project and science experiment, they'll have everyone oohing and ahhing over your basket, that's certain. Save for the alum powder (buy here! ), the materials are probably already things you have on hand. Check out the entire tutorial over at--where else--Martha's digs. A few years ago designer Valentina made a collection of furniture she called "Le Uova di Leon" that was inspired by the humble egg. Her collection included seating, lamps, tables and rugs. I enjoy dying easter eggs (really, I do...), but I don't have a use for ALL those hard boiled eggs that come out of the project. I do, however, have plenty of use for breaking things over my friends' heads and making big confetti messes, so this year, I'm making cascarones- a Mexican tradition of decorative eggs that are hollowed (blown) and filled with confetti, which are subsequently broken over others' heads. Sound awesome? You're right. Skip the kit and make your own colorful Easter eggs with this super simple recipe from smallhomestead.com.